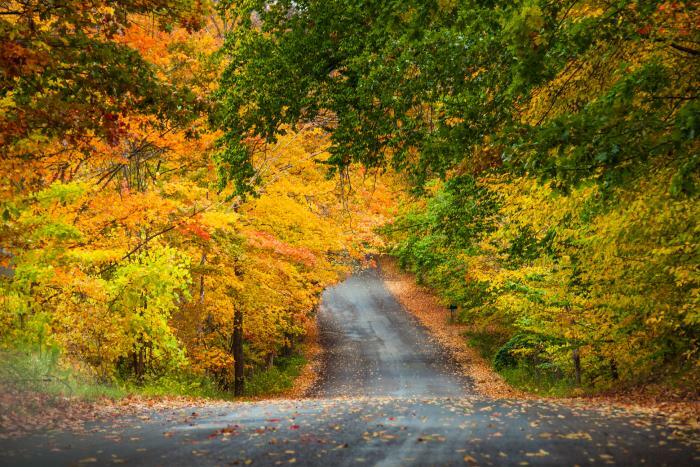 There’s no better way to enjoy the magic of a Traverse City autumn than to get out and walk about in it. Photographs are pretty, but there’s really no substitute for smelling the aromas of fallen leaves, listening to them crunch underfoot, and feeling the cool breeze brush your face as you surround yourself with in the sensory overload of this lovely, brief season. 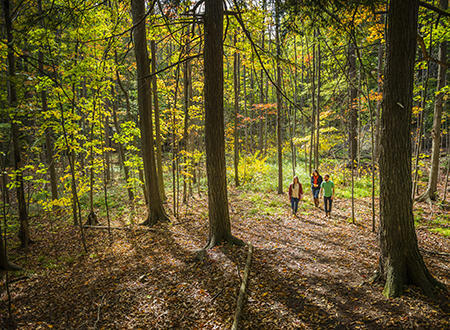 Here are a few of our favorite fall strolls, walks and hikes. All are relatively easy and close by – and a few are even in the city itself. 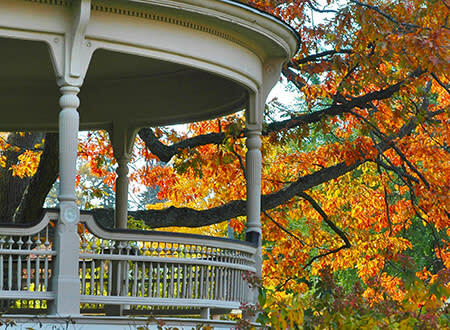 One of the nicest strolls around is in Traverse City’s Central Neighborhood – especially the area bounded by Union, Sixth, Division and Eighth Streets, which is filled with graceful Victorian homes, brick-paved streets and tall overarching trees that are lovely in the fall. You’ll see folks out raking leaves in their yards and setting up their Halloween displays. A highlight of this walk is a leisurely amble down Sixth Street, once known as “Silk Stocking Row,” where the mansions of the town’s manufacturing elite stand guard – most notably the home of Traverse City founder Perry Hannah. 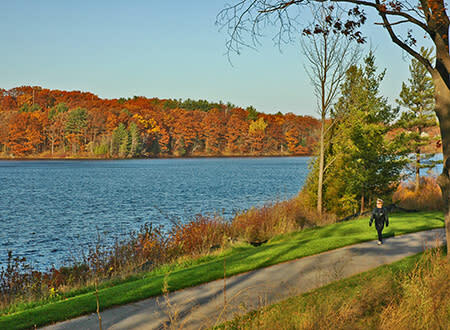 Another easy stroll is around the beautiful campus of the Village at Grand Traverse Commons, just west of Division Street at the end of Eleventh Street. The 63-acre site of this beautiful historic redevelopment includes the castle-like buildings of the former Traverse City State Hospital and an extensive network of walking paths that wind their way among the 19th-century buildings and landscaped lawns. Tucked into the northern and eastern shores of Boardman Lake, this three-mile paved pathway stretches from 14th Street, crosses the Boardman River on an elegant pedestrian bridge and heads south all the way to Medalie Park at Logan’s Landing on a series of boardwalks and paths. 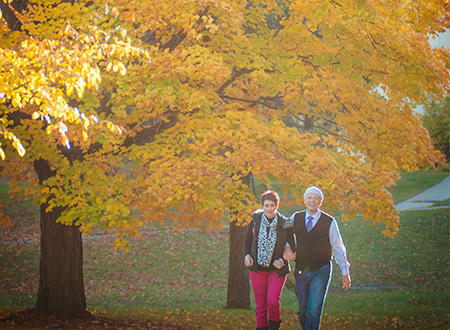 Shady and cool, it’s one of the most delightful walking paths in Traverse City, and fall is the best time to enjoy it. In autumn, the trail offers lovely views of the brilliant foliage on the wooded hills across the lake, and at its southern end there are almost always flocks of ducks, geese, swans and other birds swimming and cavorting on the water. It’s part of the regional TART trail system, so it links up with even longer routes at its northern end – in case you want to extend your walk. There’s much more to the Grand Traverse Commons than the manicured pathways of the Munson Arboretum. It’s surrounded by a sprawling 480-acre expanse of preserved parkland – steep forested hillsides, meadows, abandoned orchards and wetlands – known as the Commons Natural Area. 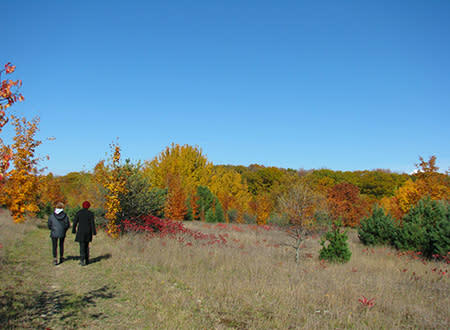 It’s richly blessed with walking trails that are used all year round – but especially in fall. Some people enjoy the strenuous Old Orchard Trail, which leads uphill to a ridge with fantastic views of the city and its surroundings. Others have just as much fun exploring the Streamside Trail or the Meadows Loop, where deer, hawks and songbirds can frequently be seen. There are several fine hiking opportunities on the picturesque Old Mission Peninsula, but the largest trail system is found at its very tip, with two parks that provide 650 acres of trails through woods, abandoned orchards and upland meadows and across rocky beaches. The system is served by three separate trailheads – and there’s even the historic 1870 Mission Point Lighthouse to add to the romance of the location. The two parks include almost 10 miles of trails. The 120-acre Lighthouse Park occupies a low, heavily forested benchland several feet above the waterline. (It&apos;s a good place to walk on windy fall days.) The larger 520-acre Old Mission Point Park is much higher, perched on a steep escarpment just to the south – and is a much more diverse place for hiking, with wonderful views of East and West Grand Traverse Bay. 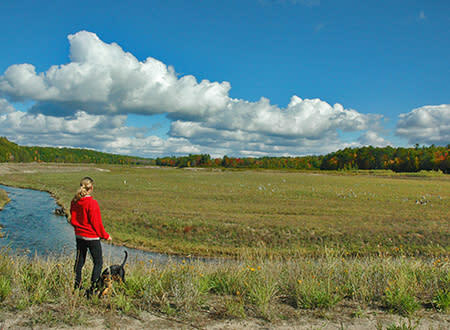 The upper reaches of the Boardman River provide some of the best fall hiking in the whole Traverse City area. One of the best places to explore this beauty is at this 1,310-acre preserve, just 11 miles southeast of town. Not so long ago, this was the site of a lovely woodland lake, but the 2012 removal of the Brown Bridge Dam has replaced that landscape with a broad river valley whose lack of trees has made it a great place to enjoy spectacular long-distance views of fall color. Thanks to its protected status, it’s also a great place to encounter wild creatures – eagles, otters, herons, beavers and even the occasional bear. There are over eight miles of trails; those on the north side of the river are on a high bluff looking down across the valley, while the trails on the south bank look up. Personally, I prefer walking along the bottom, at the edge of the old lake, so I can listen to the river gurgling beside me.